A full and comprehensive review of VyprVPN for 2015. We took a look at their VPN service, speeds, servers plus more and assessed them to give our opinion. VyprVPN are one of the darling providers of public VPN services. I first reviewed them back in December 2013 and have been a big fan of them ever since. Things change rapidly in the VPN world and with expansions, new servers and new features most VPN providers of decent quality are ever changing. I’ve personally been using VyprVPN regularly over the intervening 15 months and decided it’s time to bring you my updated opinion of their service. I rated VyprVPN one of the best VPN providers in my last review, Read on to find out how they performed and if they’re still top of the tree. 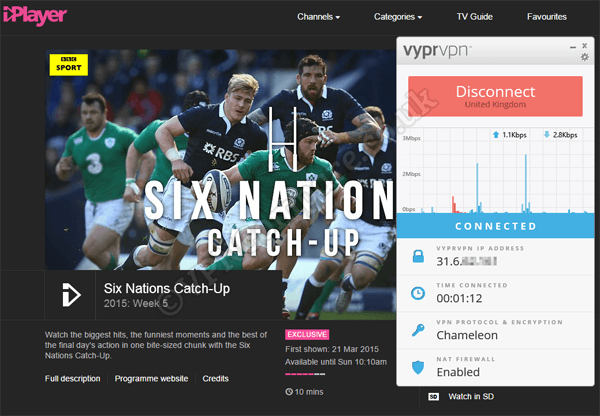 As was the case in 2013 VyprVPN have continued to offer their free 3 day trial. This is a rather unique selling point and very few VPN providers are willing to let you trial their service before you actually make a payment. Although many providers do offer money back guarantees VyprVPN are one of the few who let you take such a trial. I’ve always been a big fan of this feature of their service because it allows you to test the quality of their product in advance. One caveat of the trial is you do have to enter your payment details before you get access to the trial. If you’re happy with the service after this date you will automatically be charged and your subscription starts, if on the other hand you don’t wish to continue then the onus is on yourself to cancel the service before payment is taken however this process is extremely easy and can be accessed from your user control panel which unlike some other “free” trials isn’t hidden away so you can’t locate it. Upon signing up there are three packages available which are priced the same as in 2013 although a few added features have been included since then. VyprVPN packages are offered in monthly or yearly payment options. As was previously the case the yearly payments are considerably cheaper than paying monthly so it would be wise to consider how long you intend to use the service as a big saving can be had by signing up for a year. VyprVPN Basic costs US$9.99 p/m if billed monthly or $6.67 p/m if billed annually. VyprVPN Pro costs US$14.99 p/m if billed monthly or $8.33 p/m if billed annually and VyprVPN Premier costs US$19.99 p/m if billed monthly or $10.00 p/m if billed annually. A variety of features are available over the range of packages detailed below. A sign of a good VPN provider is that they continually improve their service. I’ve seen plenty of providers who tend to rest on their laurels and do very little for many months, providers who reinvest funds in to the business are usually those who care more about the end customer. Luckily VyprVPN are one such provider and have been expanding their service since I last took a look. This has included introducing a new proprietary protocol, adding servers and continuing to update their software and apps amongst other things. Over the past 15 months VyprVPN have expanded their server locations and now offer servers in 41 countries worldwide. Only recently they expanded in to Central and South America with Costa Rica, Panama, Argentina and Colombia their new America based locations. As well as these new western locations Taiwan has been added to the list of Asian countries added. VyprVPN have always had a good range of European, North American, Australian and Asian based servers and one of the issues raised in the last review was the lack of support for South American customers or those travelling to such areas. With the expansion that has been seen the majority of locations are now well covered with only the African continent like many providers not covered. The expansion of VyprVPN in terms of locations is quite an achievement, they are one of very few VPN providers who actually own the hardware and infrastructure of the whole of their network. This means that they do not lease hardware from third parties and so are the only ones who have control over their servers. From a security point of view this should in theory reduce the chance of third parties physically accessing their servers. VyprVPN have always offered the standard VPN protocols including PPTP, L2TP/IPSec and OpenVPN. A few months after my previous review they launched their very own proprietary VPN protocol based on OpenVPN named Chameleon. Chameleon is an in house VPN protocol designed to obfuscate VPN traffic to thwart attempts to block VPN connections. Although the technology is suitable for use in any country it comes in to its own in countries with repressive internet regimes such as China with their Great Firewall and Iran where the internet is heavily censored. While encryption is handled by 256 bit OpenVPN the actual metadata is scrambled by the proprietary technology to disguise the fact a connection is indeed VPN access. Countries like China have been using deep packet inspection (DPI) to discover OpenVPN connections and block them to stop users from circumventing website blocks. Chameleon is a way to bypass any such DPI and continue to access a free and unrestricted internet in countries that carry out such inspection techniques. Both of the two higher tier packages at VyprVPN offer all VPN protocols but one slightly disappointing aspect of the lowest tier package is it only offers the PPTP protocol. If you only want to use a VPN service to unblock content and stream abroad then this should be fine, in fact due to the lower level of encryption you’re more likely to get a faster speed and as such for streaming it is perfect. For those of you who are security conscious using the PPTP protocol is no longer suggested due to security vulnerabilities. I’d like to see VyprVPN do away with this PPTP only protocol package and allow the other protocols even on the most basic package, until then if you’re serious about your online security I would recommend avoiding the Basic package and considering the Pro or Premier. Custom software has been greatly updated especially on Windows and Mac systems. In the past 12 months DNS Servers became a big talking point in the VPN industry. While your browsing habits are encrypted and private when using a VPN the ability for third party DNS servers to log the website names you visit is possible. When accessing a website DNS Servers lookup the IP Address which is understood by computers for the easy to remember domain names that we as humans prefer. Most people as standard access their ISP DNS Servers without knowing and others use public ones such as provided by Google, both these have the ability to store the names of the sites that you visit. VyprVPN introduced their own DNS Servers last year which route all requests you make through their private encrypted servers so now what you actually get up to on websites is not only secure but the actual address of the website won’t be known by any third party such as your ISP or Google. The Windows and Mac custom software does allow you to specify DNS Server addresses so if you don’t want to be bound by their own then this is customisable in their software. VyprVPN offer custom software for Windows and Mac systems and also mobile devices such as Android and iOS which covers the iPhone and iPad. The custom software for Windows and Mac has been polished for a long time and is one of the most aesthetically pleasing I’ve seen. In my last review I found the software easy to use but missing some minor features that would give it polish. One area I raised was the lack of ability to sort servers by ping allowing quick finding of the fastest. 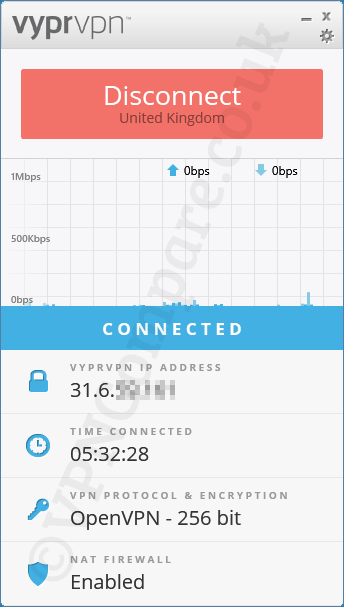 VyprVPN have not only introduced the ability to sort servers by ping but by name too and with this they have also added the ability to automatically connect to the “fastest server” without you needing to search it out yourself. A kill switch has been added to the desktop software that can be set to stop all internet activity should the VPN connection drop. Although I haven’t generally noticed any random connection drops when using VyprVPN even when connected for 8 hours straight it does give that added peace of mind that should the VPN connection drop for whatever reason no data will leak outside the VPN connection and is a welcome addition to the software. The Android app is basic but does the job and while not feature rich it does incorporate some of the newer service features such as the ability to use the Chameleon protocol and VyprDNS system. The iOS app is limited to L2TP/IPsec which I would assume is due to limitations on the iOS system. VyprVPN are registered in Switzerland. As you may know Switzerland has always had a long history of privacy and as such should make a good location for a VPN company to be based. Being located in Switzerland also removes them directly from the jurisdiction of the United States and European Union so for those concerned about mass surveillance using a company registered outside one of the major spying countries would seem like a good option. Although VyprVPN offer a great range of custom software some users will prefer to use and set up the likes of OpenVPN manually. In my previous review I noted that there was no direct or easy way to download OpenVPN configuration files for the Windows platform and it seemed the website pushed you in the direction of custom software. The range of manual guides on the website has since been updated and OpenVPN config files can now be downloaded directly from the support area. The service is suitable for a range of needs and I make use of them on a daily basis. Browsing websites, using Skype and a range of other general internet tasks work well without issue. The overall VyprVPN network is extremely reliable and even making use of their server in Panama offered good speeds for daily general use. One of the best aspects of the service is the reliability and quality of connection on a general basis. One area where VyprVPN have been disappointing of recent is the inability to achieve the maximum speed of my internet connection on their UK servers. In recent UK server speeds tests I’ve found them to under perform and while they are extremely efficient at everyday browsing and internet use heavy downloaders would be disappointed at the lack of being able to maximise their internet connection. After discussion with VyprVPN they inform me it is a known issue with my ISP and they are working on the issue. With my ISP being the third largest in the UK by subscriber numbers lets hope they resolve it soon! The VyprVPN desktop software is actually rather good but one issue I did experience on more than one occasion is when updating or reinstalling on a Windows 8.1 system. The TAP driver seemed to fail to install even though I both ran as an administrator and allowed changes to be made. There seems to be a conflict with the Windows 8.1 User Account Control (UAC) settings as this happened on more than one Windows 8.1 system. The solution was to uninstall the VyprVPN software, reboot and lower the UAC settings to “Never Notify” then install and after higher the UAC settings back to default. Although not difficult or long winded for a new user it could be frustrating and this Windows 8 issue with their software could cause headaches for beginners. VyprVPN is a VPN provider that I use on a regular basis. In general I find them to offer a reliable service that offers consistent speeds. The infrastructure of their network seems robust and unlike some other provider who feel shaky when using their servers I feel secure which is reassuring with the long periods of time I stay connected on my desktop. Using the service for everyday browsing and streaming content abroad such as BBC iPlayer even in HD rarely caused an issue and is one of the reasons why I make regular use of their service. One area which has recently started to concern me is the speed achievable on their UK servers with the ISP I use. As discussed earlier in this review VyprVPN are aware of this issue and and working to resolve it however up until a resolution receiving around 30 mbps of a 152 mbps connection is less than ideal. So while great for everyday use those who heavily download or use bandwidth intense tasks may wish to bare this in mind. As with all providers we download a 10gb test file using a download manager to open the maximum number of concurrent connections available. All downloads are carried out from within the United Kingdom so results for yourself may vary. The test was carried out using the Windows desktop software available from VyprVPN using OpenVPN via UDP with 256 bit encryption. VyprVPN offer the three main protocols and their own proprietary Chameleon protocol based on OpenVPN. When using the VyprVPN custom software the following encryption options are available for OpenVPN. I intended to use 256 bit encryption manually with OpenVPN but was unable to do so. When using the supplied configuration files only their 160 bit option is available. I queried this with their live support who confirmed it wasn’t available for manual set up and they did not have the specific information as to why. This is definitely something I’d like to see rectified for those who prefer manual set-up. The VyprDNS system does not store or log any requests so the website domains you visit are anonymous. VyprVPN are a Swiss registered company but policy information seems to suggest that billing details may be stored in the United States. It is unclear where such details are stored but does state that European Union customers will be afforded the same data protection as US based ones, better clarification about where such data is stored and how this affects the end user is needed in the policy area. One area that makes VyprVPN stand out from the crowd is their Support. Support is offered every day of the year at any time. A contact form is available on their website but one major benefit of the service is access to live help. Although there are other providers who offer live help and some that offer live help at set times, VyprVPN are part of an exclusive club of VPN providers that offer live help 24 hours a day. As part of my test I contacted live help to enquire about different issues, some general and some more involved. Their support staff are helpful and friendly, they also appear knowledgeable surrounding your query and I did not get the impression they are massively scripted. Their support staff appear to be natural English speakers which makes communication easy and resolving your issues or queries should be possible without issue. Although VyprVPN may be slightly more costly than some other provider it is areas such as these where they really come in to their own. As prices are competitive across the VPN industry it is features such as live help that really add value to a service. VyprVPN are one of the more professional and bigger VPN outfits. Their service is reliable and dependable. I find connection very robust and could easily stay connected for 8 or more hours without any kind of connection drop or noticeable speed issues for everyday internet tasks. The service has expanded nicely since my last review in December 2013 and by adding new VPN server locations in Central and South America they have definitely improved the overall global coverage on offer. Due to this expansion the service would be suitable for most users globally or those who travel regularly as apart from Africa most other continents are now well covered. Software for Windows and Mac and apps for Android and iOS are well thought out and their desktop software has certainly been polished since my last review. Added features such as their own custom DNS servers, a kill switch and added finesse with sorting of servers by ping and alphabetically really make the end user experience pleasing. While VyprVPN offer a robust connection I struggled to achieve the maximum speed of my rather fast internet connection. Daily internet use was fine but those with high end connections may be slightly disappointed to not be able to achieve near maximum speeds. The cost of the service is competitive for the added services available although when paying monthly they are slightly more expensive than other competitors, buying a yearly account is definitely something to consider due to the huge saving available. I’m not entirely sure why VyprVPN continue to sell a Basic package that only offers the PPTP protocol and I would love to see this include at least OpenVPN in future. If you’re after streaming content only then the Basic package will be fine but if you want to protect your privacy then better encryption is needed and their Pro or Premier accounts are the only viable option. Overall VyprVPN are a solid and reliable VPN provider, if you have an ultra fast internet connection you may struggle to achieve top speeds but for everyday use and streaming they are incredibly robust and have not let me down. Their expansion has been continual and steady and although their monthly prices may be slightly at the higher end of the scale they are investing in infrastructure which makes it worthwhile. I use VyprVPN regularly and would definitely recommend their Pro or Premier package for wi-fi safety, general internet use and streaming content abroad. A few areas could be improved on but in general an all round good and reliable service.